BARBARAELLEN KOCH FILE PHOTO | Riverhead Police headquarters and the town's Justice Court are housed in the same building. 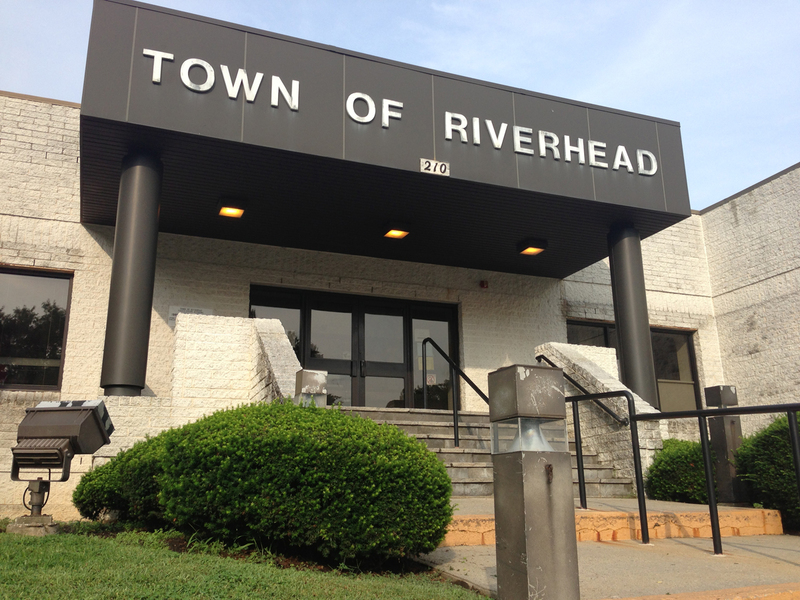 A Riverhead police officer is being accused of beating a handcuffed drug suspect in the front hallway of the police headquarters and Justice Court building in February 2007. Veteran officer Peter Troyan — who was never criminally charged in the case — is facing a $1 million federal civil rights lawsuit for allegedly attacking William Robinson after Mr. Robinson was arrested on a drug charge and for driving with a revoked license and arraigned in Justice Court, according to federal court records. That news surfaced Tuesday, the same day Mr. Robinson’s lawyer released a video that appears to show Mr. Troyan punching Mr. Robinson three or four times near the building’s metal detector as Mr. Robinson lay on the floor. The suit was initially filed several months after the alleged beating in 2007 and the case is expected to go to trial this November. Later in the surveillance video — which was shot inside the hallway leading from Justice Court to the police station — it appears Mr. Troyan kicks or throws his knee into Mr. Robinson’s face before walking away. Mr. Robinson is then carried off screen by three other cops. Mr. Robinson called the attack unprovoked, though a Newsday article published Tuesday reported that his lawyer said the alleged beating came in response to Mr. Robinson telling another officer to “Get the [expletive] off me” while the other officer tugged on him during a Justice Court appearance. Mr. Robinson, 42, was taken to Peconic Bay Medical Center for lacerations on his face and lower back, bleeding under the skin and nerve damage to his left arm, according to the complaint. Newsday was also given medical records that reportedly showed Mr. Robinson suffered cuts and bruises, but declined to get stitches in his mouth. Mr. Robinson’s attorney, Brian Dratch of New Jersey, did not return a call or email seeking comment. Riverhead town attorney Bob Kozakiewicz said Mr. Troyan, whom he believes has about 20 years on the force, is being represented by outside counsel, Scott Middleton of Bohemia, at the town’s expense. “I have no comment other than to say, let the courts resolve the matter, and we’re confident they’ll resolve it in [Mr. Troyan’s] favor,” Mr. Kozakiewicz said. Mr. Middleton, who took over the case earlier this year, said a grand jury had considered criminal charges against Mr. Troyan years back and decided against charging the officer. A civil jury in federal court in Central Islip will now hear the same or similar evidence and testimony, Mr. Middleton noted, and added that he expects another favorable outcome for his client. He added that he did not want to divulge more information, especially just days before Mr. Robinson’s deposition is scheduled for Friday at Sing Sing state prison. But he pointed to Mr. Robinson’s long criminal history, which law enforcement officials later said includes 17 criminal convictions. Mr. Robinson is currently serving a six year sentence at Riverview Correctional Facility upstate for criminal sale of a controlled substance and promoting prison contraband. He is eligible for release in June 2012. He’s being transferred from there to Sing Sing for his deposition Friday. His February 2007 arrests in Riverhead resulted from a drug charge for possessing a crack pipe along East Avenue and for driving without a license. His was revoked after he was found driving without insurance. He served 90 days in the county jail on those charges, during which time he was arrested when corrections officers found what was described as a single edge razor in a bar of soap, authorities said. Jury selection in the case is scheduled for Oct. 31. The case is set to start Nov. 7 in Central Islip. The response then calls the charges frivolous and requests the suit be thrown out, a request that was apparently denied. An attorney previously representing Mr. Troyan filed a motion for settlement in March 2010, claiming the parties had agreed to settle for $10,000, court records show. Mr. Robinson later personally contacted the court in a written statement denying he had agreed to a settlement and that he had dismissed his previous attorney. Vera Chinese contributed reporting to this article. Warning: This video contains images some may consider disturbing.